Child Admission is for ages 7-12. Age 13 and up are General Adult Admission. Children 6 and under are free. VIP Package: Limited quantities, not available for all events. Includes admission for one (1), goodie bag, keychain, poster and early entry (must arrive at spectator ticket booth by 11am). All tickets are non-refundable. 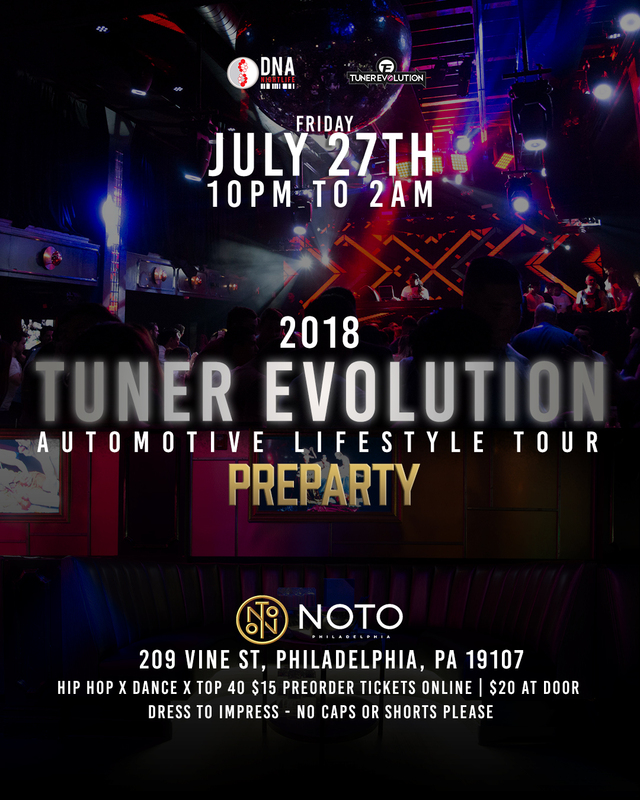 THE OFFICIAL TUNER EVOLUTION PRE PARTY is going down FRIDAY JULY 27th at NOTO, Philadelphia's Premiere Nightlife Venue. Mingle and rub elbows with over a thousand eclectic souls from the car enthusiast community, models and fun loving club-goers who want to dance the Summer night away. Janis True's BIRTHDAY Celebration and special appearances by Brittani Paige and many other Tuner Models! Click Here for more info! Ticket sales are currently closed for this event. Tickets will still be available at the door on the day of the event. Copyright © 2019. Tuner Evolution.